Door Handles, Window Latches, and more. 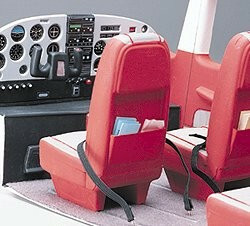 Plastic Pieces for the Instrument Panel, Floor, Side Panels, Control Yokes, Front and Rear Seats, and Aft Bulkhead. CA, Hobby Knife, Scissors, Sandpaper, Paint, and Spray Adhesive. The Instrument Panel Decal is NOT Included, use the decal from the building kit.